One of the 17 drawings created between December 1980 and January 1981.The Blue Print Drawings were prominently featured in Haring’s first solo exhibition in New York City. One of the 17 drawings created between December 1980 and January 1981, the original of this print was executed on vellum with Sumi ink, as Haring intended to make blueprint copies of each work. Periodically, he would take his drawings to the local blueprinters, where he became charmed by disjunct between the content of his work and the technical schematics with which the printers were most familiar. 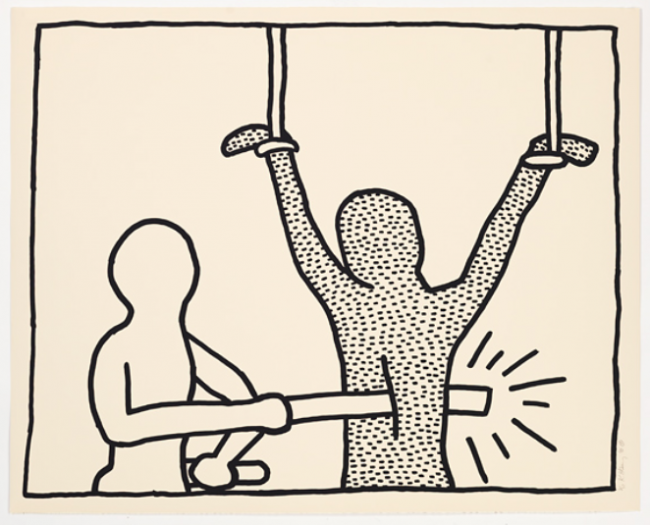 These works were prominently featured in Haring’s first solo exhibition in New York City. The exhibition lasted for one week, during which he sold several blueprint copies of the drawings. However, before he sold any of them, he made photostats of each of the drawings. This print is sourced from one of those stats.